State Department Spokeswoman says the issue of Iran, among other things, came up in Secretary of State's meeting with Netanyahu. 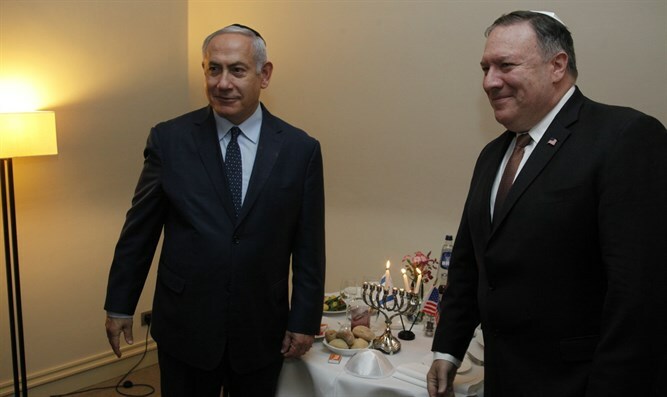 US Secretary of State Mike Pompeo stressed the US commitment to Israel’s security during his meeting in Brussels on Monday with Prime Minister Binyamin Netanyahu, State Department Spokeswoman Heather Nauert said. “The Secretary emphasized the United States' commitment to Israel's security and absolute right to self-defense and to fighting anti-Israeli bias at the United Nations,” said Nauert. “The Secretary reiterated US support for warming ties and increased dialogue between Israel and its neighbors in the Middle East and Africa, including Oman and Chad. Secretary Pompeo noted the strength of the US-Israel alliance and our multifaceted cooperation. He reiterated America’s resolve in confronting the totality of the Iranian regime’s threats through maximum pressure,” she added. The meeting between Pompeo and Netanyahu lasted for more than four hours. The discussion focused on the various threats emanating from Iran and which have implication on Israel, including the missile precision factories in Lebanon and the Iranian satellites on the Syrian border. The two also discussed the US proposal to condemn Hamas, which will be brought for a vote at the UN later this week. Pompeo on Monday evening summarized his meeting with Netanyahu in a post on Twitter. “This evening in Brussels, I met with PM Netanyahu. It was a joy to wish him a Happy Hanukkah as we lit candles on the menorah. Chag Sameach! I also emphasized our commitment to Israel’s national security and absolute right to self-defense,” he wrote.